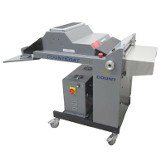 The CountCoat GT is a fast, flexible, and economical UV coater. It's ideal for shops doing a multitude of small jobs. It features a small footprint and and simple operation. 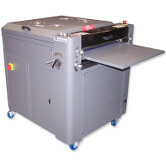 This hand fed 15" wide unit is designed to do high-quality UV coating without a high price tag. 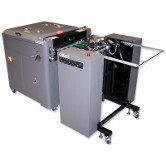 The Spectra-Coat 20" UV Coater is available as a hand-fed unit or with an air feeder. It runs up to one-quarter inch thick substrates, with an option of running up to 1 inch thick substrates. The Spectra-Coat 25" UV Coater is available as a hand-fed unit or with an air feeder. A deep-pile outfeed stacker is also available. It runs up to one-quarter inch thick substrates, with an option of running up to 1 inch thick substrates. 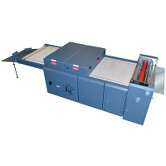 The Spectra-Coat 30" UV Coater is available as a hand-fed unit or with an air feeder. A deep-pile outfeed stacker is also available. It runs up to one-quarter inch thick substrates, with an option of running up to 1 inch thick substrates. 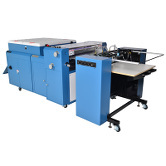 The Spectra-Coat 36" UV Coater is available as a hand-fed unit or with an air feeder. A deep-pile outfeed stacker is also available. It runs up to one-quarter inch thick substrates, with an option of running up to 1 inch thick substrates. The Spectra-Coat 40" UV Coater is available as a hand-fed unit or with an air feeder.A deep-pile outfeed stacker is also available. It runs up to one-quarter inch thick substrates, with an option of running up to 1 inch thick substrates.